Sometimes, things need time to evolve. And when they finally arrive, all laborious work and cumulated frustration is almost immediately forgotten in a flash of joy, a little bit of pride, and a lot of relief. 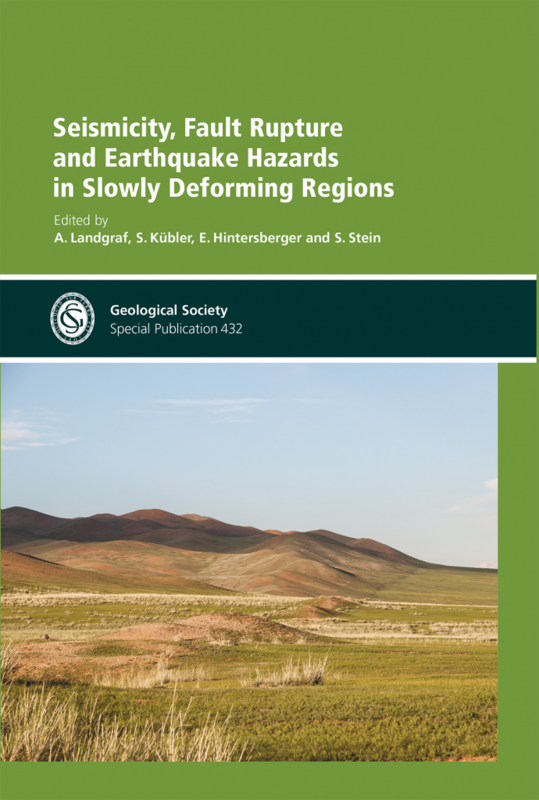 What sounds pretty pathetic here is a summary of the process that lead to the recent Geological Society of London Special Publication 432: Seismicity, Fault Rupture and Earthquake Hazards in Slowly Deforming Regions. While we will mostly advertise the volume, which should be of broad interest to the Paleoseismicity community (so please buy it, like it, share it! ), we would also like to share some thoughts about why four years passed between submission of the volume proposal at the end of 2012 to seeing the book finally in the shelf at the beginning of 2017. This book explores challenging issues of characterizing earthquake occurrence and assessing the resulting hazards in slowly deforming regions. It combines seismological, palaeoseismic, geomorphological, and structural investigations from intraplate settings and diffuse plate boundaries. The resulting views provide insight into the physical processes involved, which might help to improve earthquake hazard estimation. The introduction, which is open access, provides a brief review of some ideas to keep in mind when dealing with slowly deforming regions. Because different people have different ideas about how slow is slowly deforming, but some concepts seem to apply to a wide range of deformation rates, we decided early to include diffuse plate boundaries. The volume thus contains conceptual papers and single papers addressing specific sites. It also includes papers bringing diverse perspectives to the same study area in Central Asia. Hence the different titles cover a variety of methods and viewpoints, and together yield a balanced volume covering the topic. With other (globalized) words: people, who read paper x were also interested in reading paper y and z … (x, y, and z all being part of our volume). Four years are long enough for many things to happen: authors might change jobs and funding schemes, finish their PhDs become parents, or even die – all of which happened during the time elapsed in processing the volume. Some of these left their traces. We started our proposal with a sufficient list of authors who addressed interest in publishing their work in our volume. After the proposal reviewers suggested searching further for worldwide representative studies, this list expanded. Thus we were confident that we could complete the process in a reasonable time. The Society offers “online first” service: “We are also able to offer online publication ahead of print, where papers get published online shortly after acceptance without having to wait for the whole book to be completed (http://www.geolsoc.org.uk/onlinefirst).”, which we expected would appeal to our authors. Our sense is actually the opposite – we suspect that a paper in a book focusing on this topic, and distributed by a major scientific society, will have greater visibility than an isolated paper in a journal. Certainly this issue is worth thinking about. But besides some of the trouble we went through in compiling the volume, we had great fun and enjoyed the opportunity to benefit from the scientific input of such a diverse range of earthquake scientists that eventually lead to publication of this book.